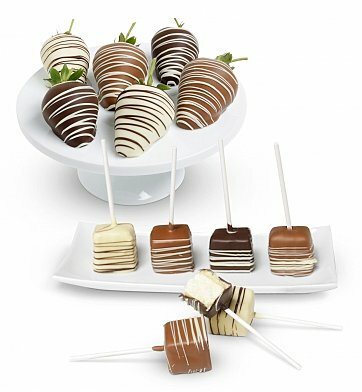 Six juicy strawberries are hand-selected for their size and freshness, and four rich cheesecake pops are hand-dipped in luscious milk, white or dark Belgian chocolate. Smooth and finished with contrasting Belgian chocolate drizzles, this decadent gift is handmade by Artisans in a gourmet kitchen. Six (6) Fresh Strawberries Covered in Belgian Chocolate. Four (4) Chocolate-Covered Cheesecake Bite Pops. Berries and cheesecake pops are wrapped for freshness and nestled in compartment trays within an elegant gift box. A free card with your personal gift message is included. Chocolate Strawberries and Cheesecake Pops is a hand delivered gift. These gifts are delivered by one of our local design centers located throughout the United States and Canada. Same day delivery is available for most gifts when ordered before the cutoff time. The cutoff time for Chocolate Strawberries and Cheesecake Pops is in the recipient's time zone. 6 fresh ripe strawberries and 4 cheesecake bite pops. Dipped in Belgian chocolate and decorated with contrasting drizzles.